I have just seen the news and comments on TV regarding the Hull match. I am delighted with the result and the performance however I am very disappointed to see the banner produced for Arsene Wenger`s attention. 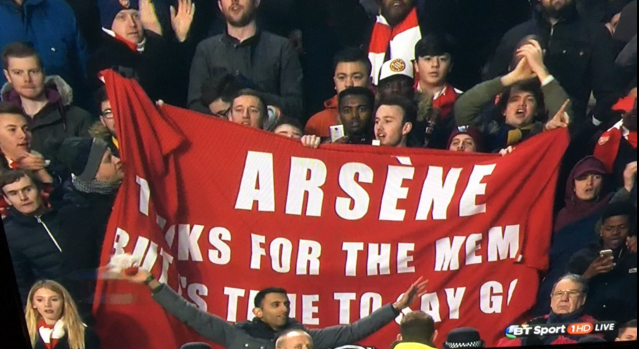 I am well known as a critic of Arsene but there are two messages on the banner – Time to say goodbye and Thanks for the memories. I do agree with the first part but the second one is the reason why I cannot agree with the way the message was presented. There is no denying the achievements Arsene has made for the club and whenever he does retire he will have left it in a better position and with a bigger footprint than it had when he arrived. For those reasons, I think that our thoughts on his retirement should be confined to our own media and not exhibited on global television. It has a whiff of anarchy about it and Arsenal FC is better than that. I for one do not want to see Arsene`s name dragged through the gutter. It demeans our club and what message does it present to a prospective successor? Do the people who produced the banner think that they have made it easier for a top class ( or potential top class ) manager to come to Arsenal if his predecessor had been here for 20 years and never failed to make the top 4 in Europe? Would he expect to improve on that and if not, to suffer the same fate? Why would he bother? It is significant that Arsene says that the banner did not make him afraid. When he looks at the history of the club and considers what he has achieved, he has nothing to be afraid of. I think that there is merit in the underlying message in the second part. At present his greatest achievements are memories. It is 12 years since “The Invincibles” and we have only won three FA cups since then. I do not want to minimise the value of the cup but really, we would have expected to win at least one of those. The reason we have not was in large part delivered in last nights match. Once again Ramsey went off with a soft tissue injury. 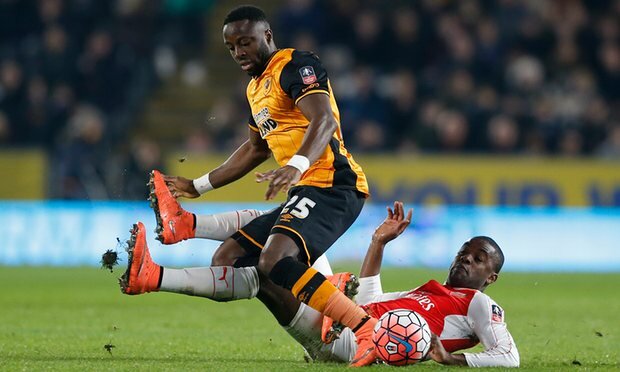 His hamstring or thigh muscle appears to be torn and Gabriel joined him. Meresecker went off with concussion which was unavoidable but the lack of cover in the central defence was once more down to poor preparation. Subs are not being warmed up properly. 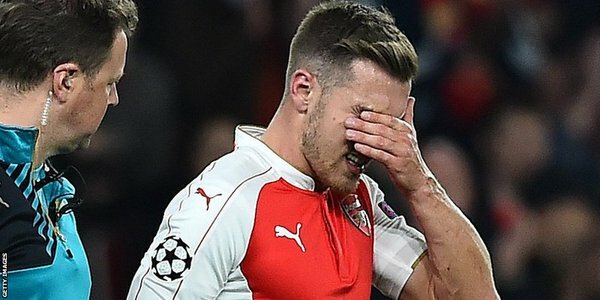 Ramsey came on with little or no time to warm up and he was stricken after 16 mins. The last time Walcott suffered the same injury, he had only been on the field 14 mins. There had not been enough warm up time in both cases. The lack of cover was because Arsene would not spend the money on a position which he clearly should have covered. 1. Chambers is not a substitute for a right back but he is a decent centre back. He was given a tough time at right back but when Flamini came on and he was moved to the centre, the improvement was immediate. That is where his future is. Incidentally, I did not want to see Flamini on again but at least he could not do as much damage on the right. 2. Elneny was a bargain at 5.5m. He is a future diamond as a creative midfielder. His first touch is excellent and he has already picked his pass before he gets the ball. His pass completion percentage must be very high but he is not a tackler. That role should have been covered two transfer windows ago. 3. We have two very promising youngsters in Iwobi and Adelaide but they are not there yet. They both acquitted themselves well, but West Ham, Everton, Watford and Man City will be different animals to Hull. It is a bit much to blood these lads in high pressure games like these. 4. Gibbs has performed well since he came back at left back and it helps Monreal to cover at Centre back. Monreal is a real asset in defence. 5. Campbell is a grafter. He supports his wing play with enthusiastic defending. 6. If Giroud is selected, he has to be told to stay in or near the box. That is where he is most dangerous. When he strays to the wing, he does not create the same havoc that Welbeck does. I suggest that they could actually complement each other. It is worth trying. Opposing defenders would have plenty to think about. We still have 9 games to go and we can only hope that Arsene will look back at this season when it ends and take a long hard look at the outcome. I fear that we shall have a battle to remain in the top 4 as I have already pointed out previously, we are closer to being 5th than 1st and unless we cope with our injuries and the tough run in, he will have serious questions to ask himself.